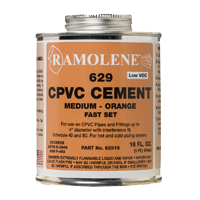 Ramolene™ 629 for CPVC™ is a LOW VOC, Orange, Medium Bodied, High Strength, Fast to Medium Setting CPVC Solvent Cement for all classes and schedules. This cement is manufactured in the U.S.A. This Cement is for use on CPVC pipes and fittings. This cement may be used for up to 6” pipes and fittings with interference fit for pressure such applications as potable water, irrigation and up to 8” pipes and fittings with interference fit for non-pressure applications such as drain, waste, vent, sewer, and conduit. This cement can be used for HOT and COLD water applications and is approved for use on Flow Guard Pipes and Fittings. 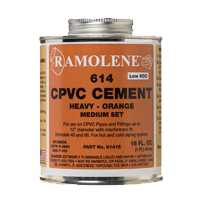 Ramolene™ 614 for CPVC™ is a LOW VOC, Orange, Heavy Bodied, High Strength, Medium Setting CPVC Solvent Cement for all classes and schedules. This cement is manufactured in the U.S.A. This Cement is for use on CPVC pipes and fittings. 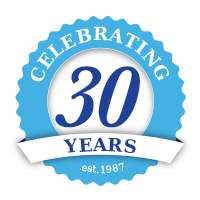 This cement may be used for up to 12” pipes and fittings with interference fit for pressure such applications as potable water, irrigation and up to 14” pipes and fittings with interference fit for non-pressure applications such as drain, waste, vent, sewer, and conduit. This cement can be used for HOT and COLD water applications and is approved for use on Flow Guard Pipes and Fittings.